The research has turned up a large number of images from this site, most having been made by the Ludwig-Svenson Studios of Laramie. 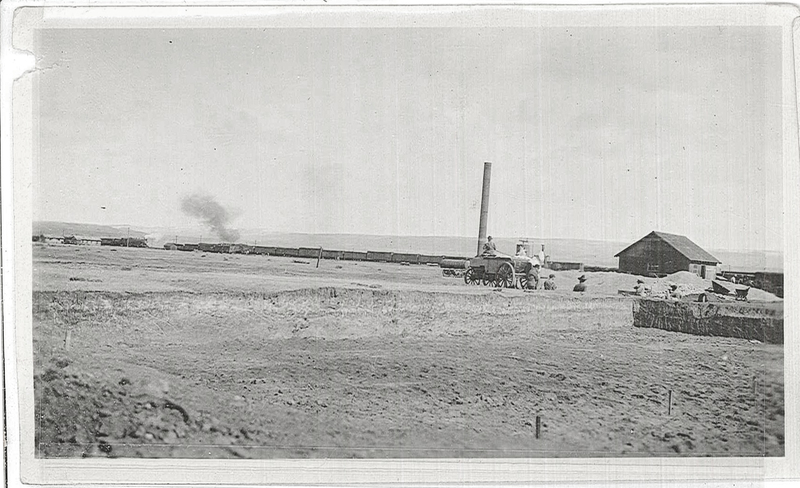 However, a recent discovery has provided even more detail about the construction of the refinery itself. 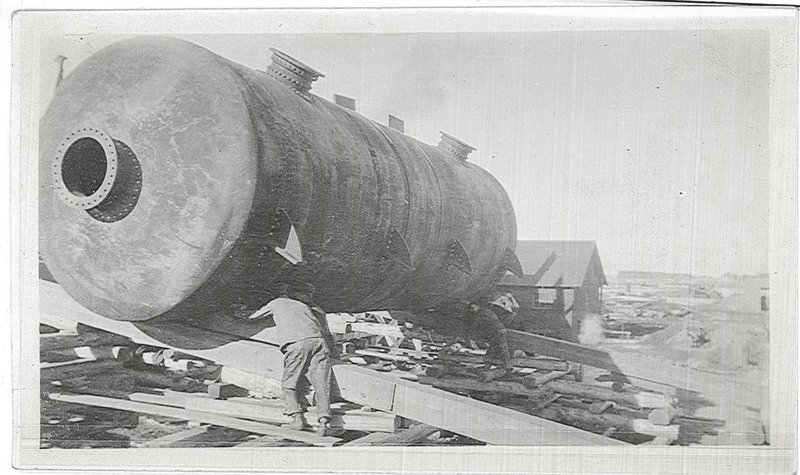 These were in a collection of images that was simply titled “Standard Oil Refinery, Laramie, Wyoming” With a date set of 1919-1921. More images will be added as they become available. 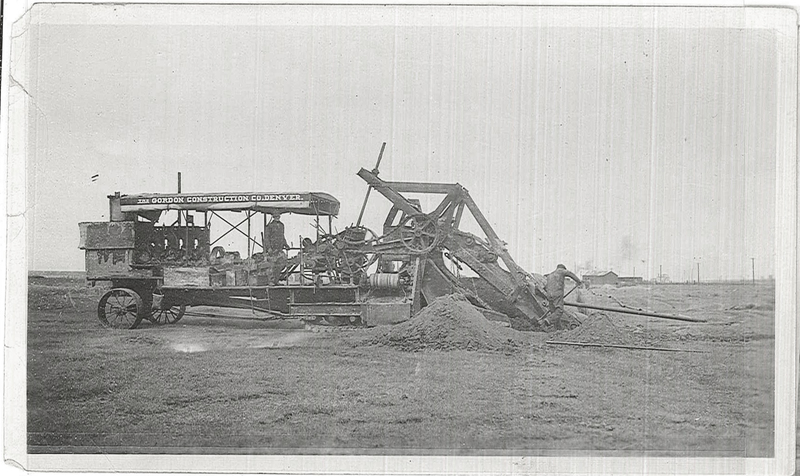 This ditch digging machine is the early predecessor to the modern trencher. 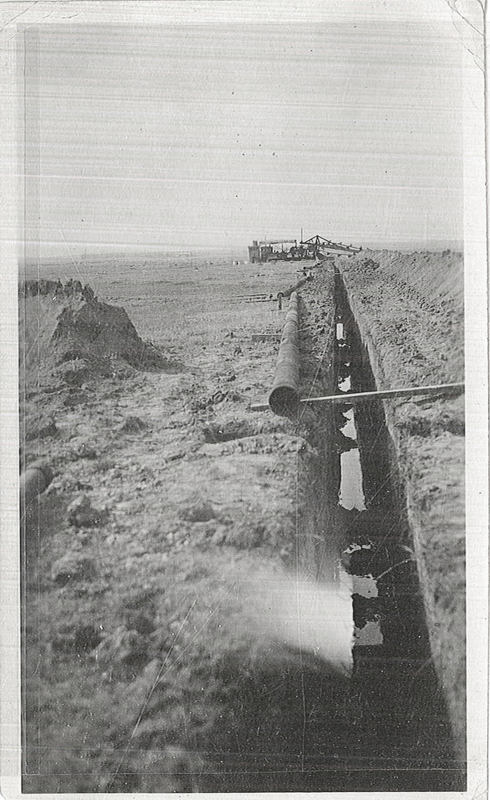 Pipes line a trench near the eastern edge of the refinery property. 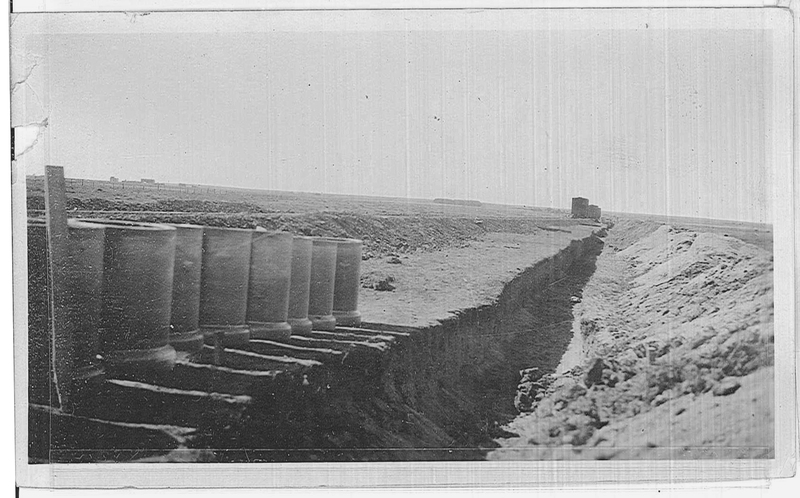 Pipes are laid out next to a trench. 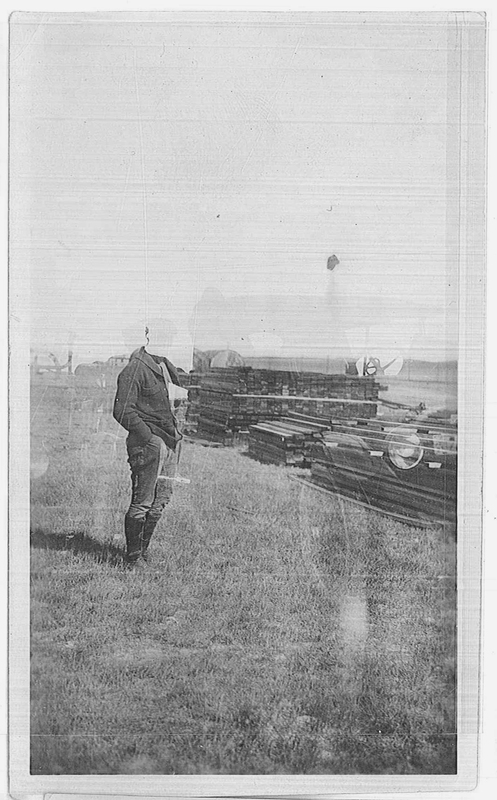 Note the rail cars in the distance and the rail line that was placed for the delivery of equipment. 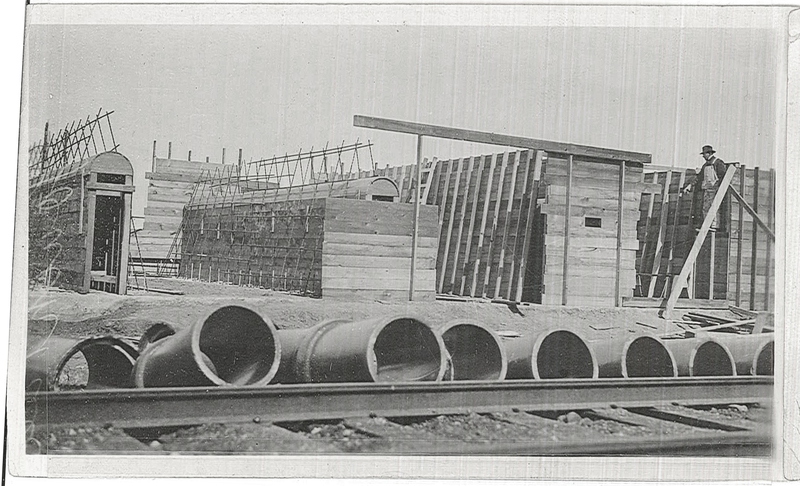 These rail lines would later be used to transport oil products from the site to market. 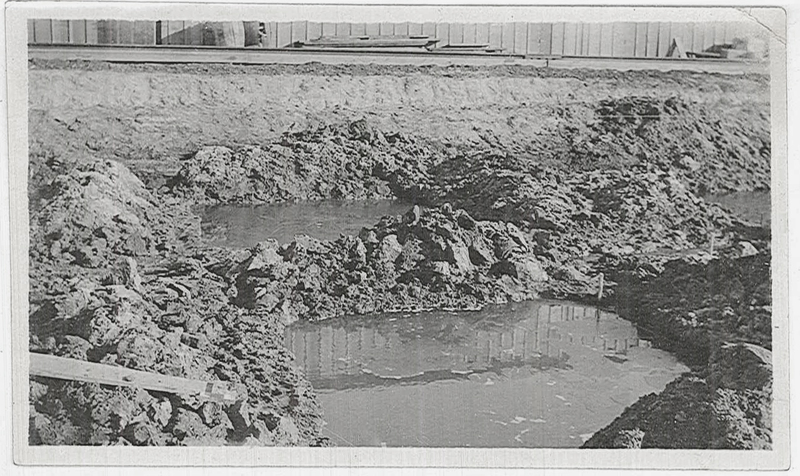 A trench has filled with water shortly after being excavated. The exact use for the pipe is unknown. 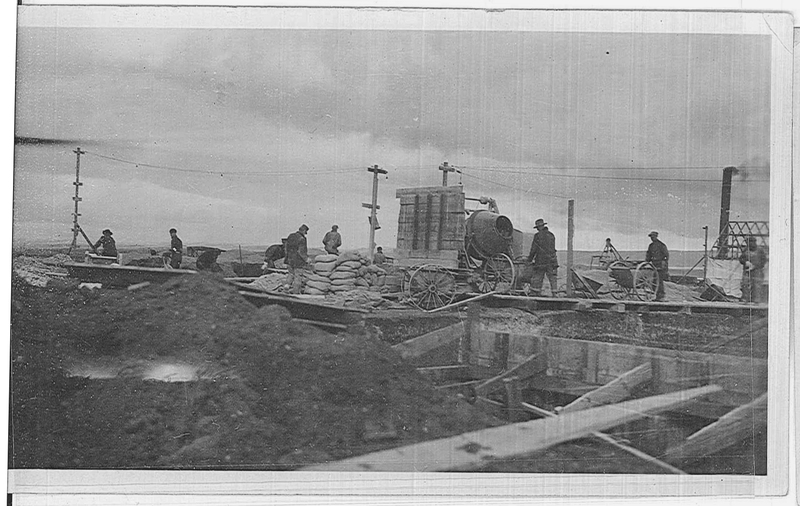 Note the ditch digging machine in the background. 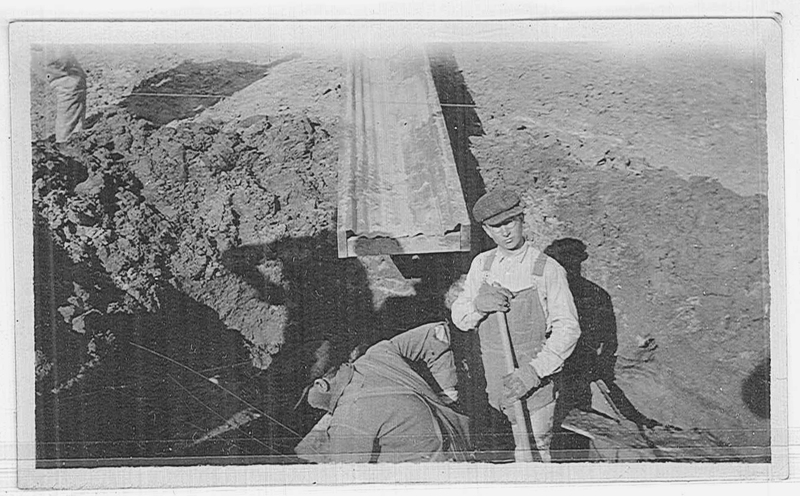 Unidentified workers digging a trench. 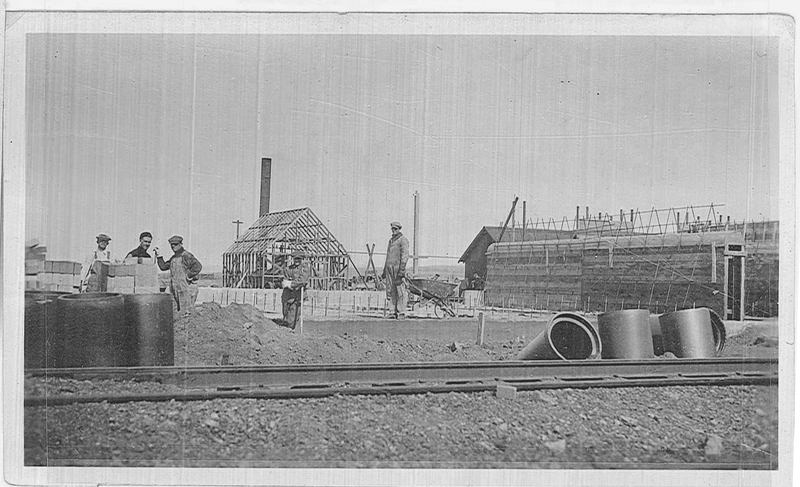 Unidentified workers excavating to set forms for a foundation. Supplies were stacked near a temporary warehouse. 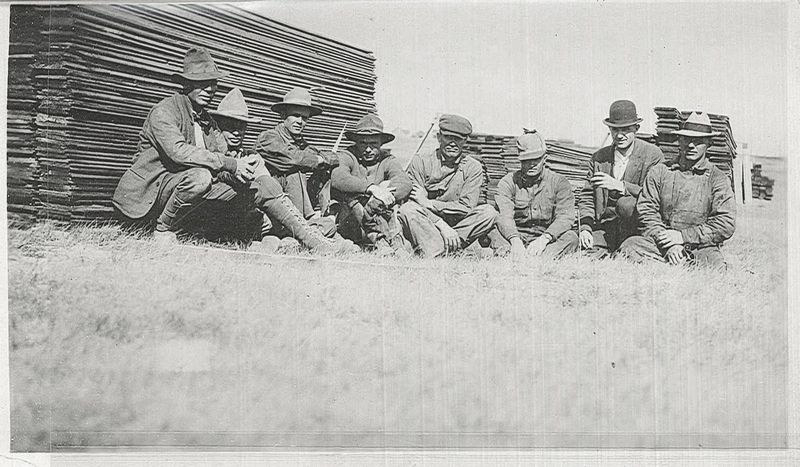 A group of men sit near stacks of lumber that would be used as concrete forms. 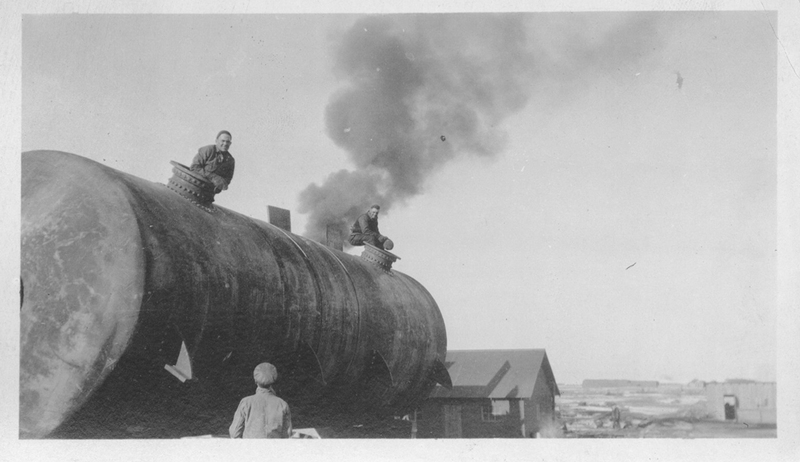 Note the tanks in the background. 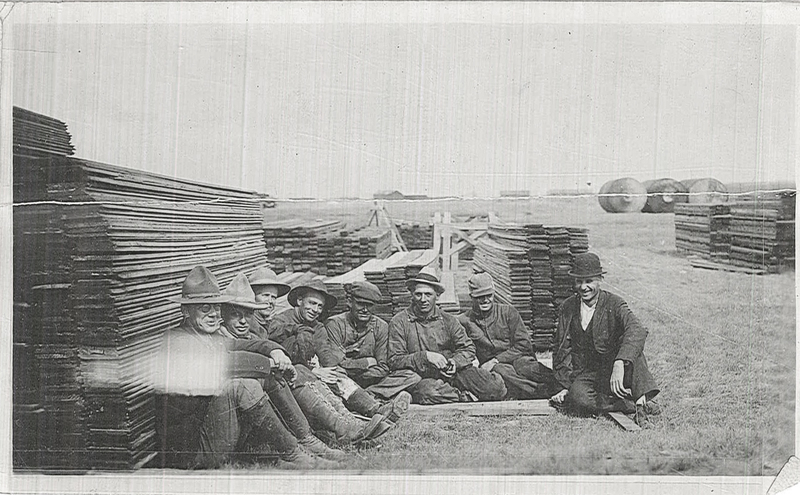 A group of men sit near stacks of lumber that would be later used as forms for concrete. As was common with early photographs that were made with glass plates, one image is superimposed over another. 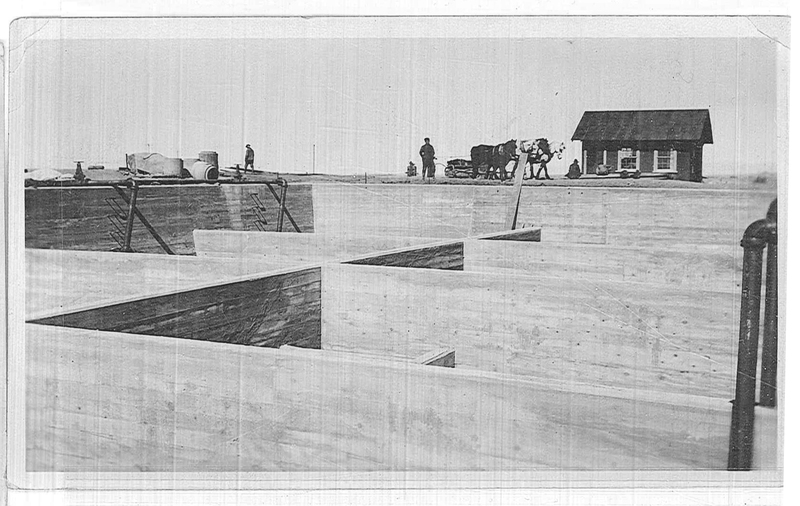 The lumber in this image was probably used as concrete forms. Earth has been excavated, and is waiting for forms. 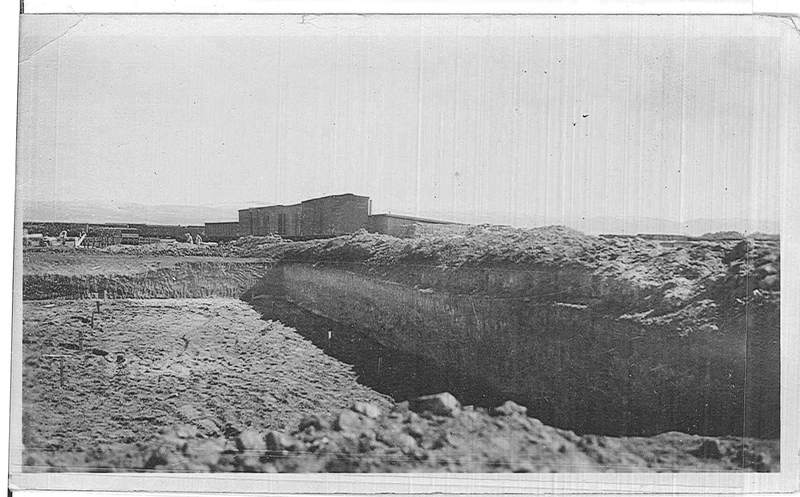 Earth has been excavated to place forms for a foundation, (possibly the laboratory). A foundation is being prepared. 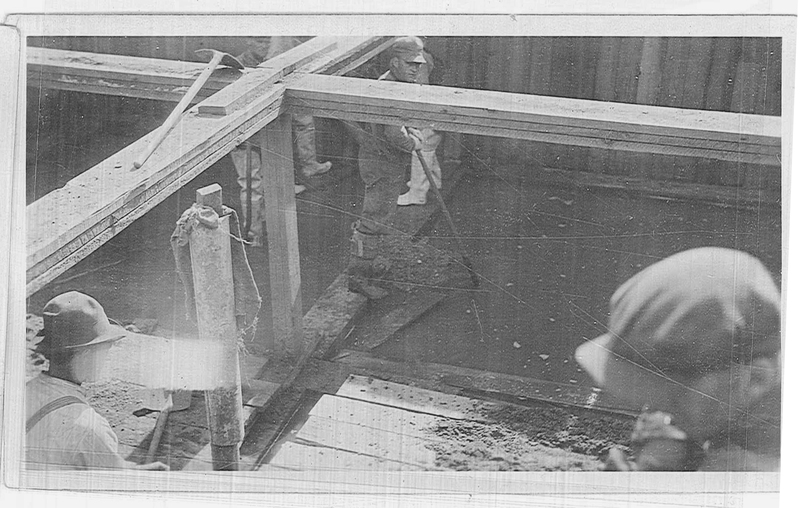 A worker prepares one of the concrete forms. 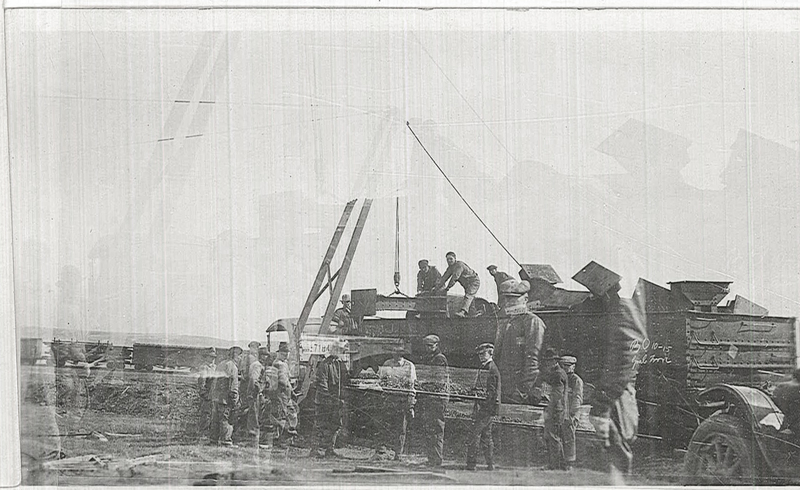 A crane is used to lift one of the panels that would be used for one of the storage tanks. Double exposures were quite common in the early days of photography – especially with glass plates. 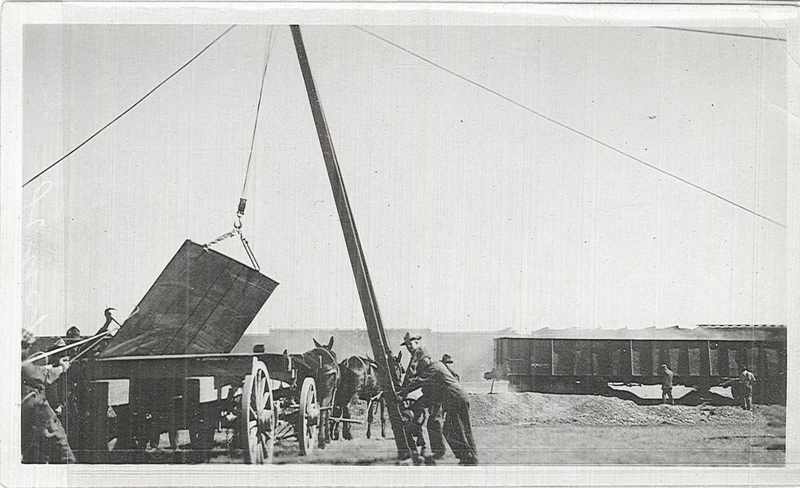 The rail car and truck were probably the intended subjects. 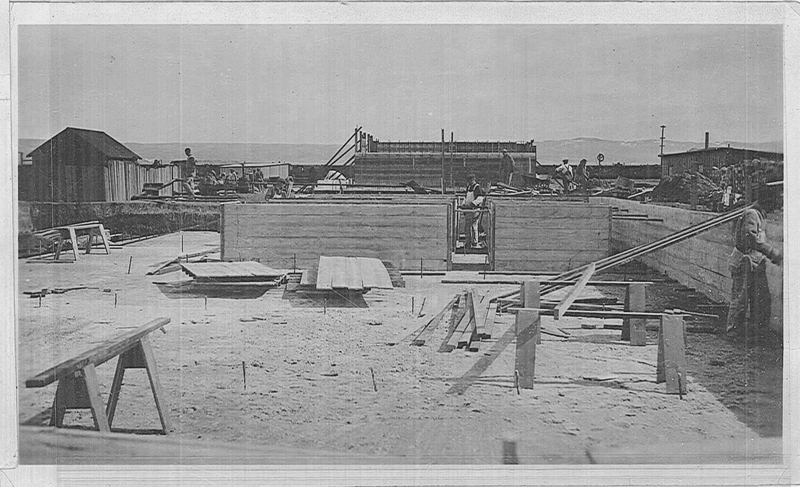 A view from inside one of the storage tanks under construction. 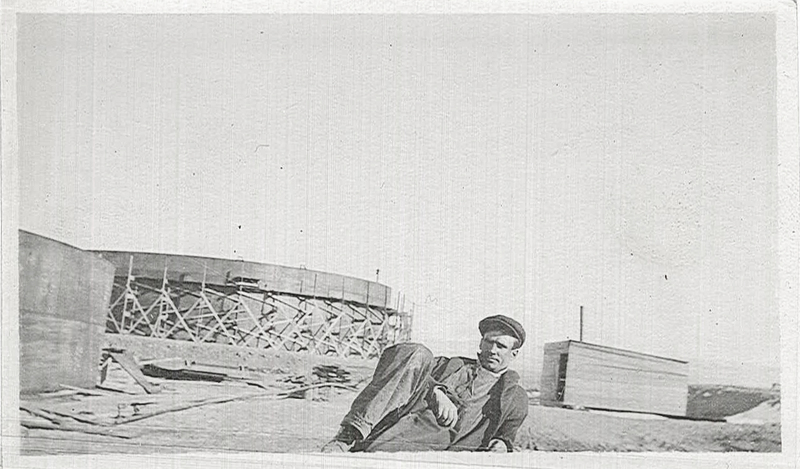 An unidentified worker takes a break near the tank farm as its being constructed. 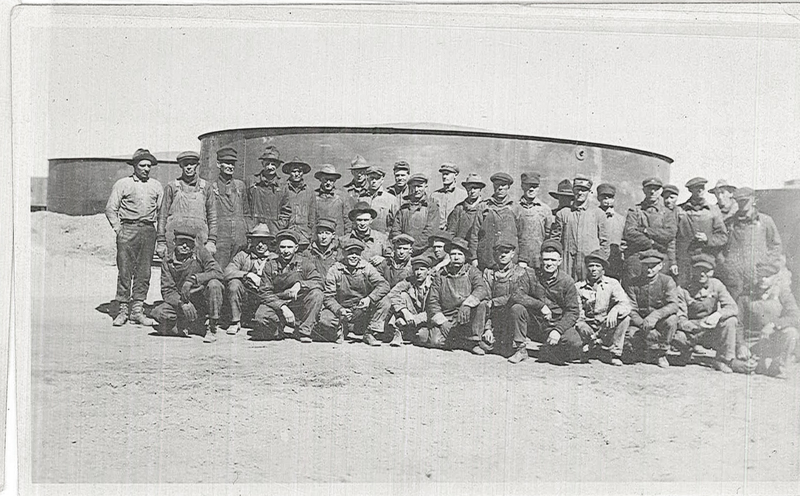 A group of men stand in front of a storage tank. 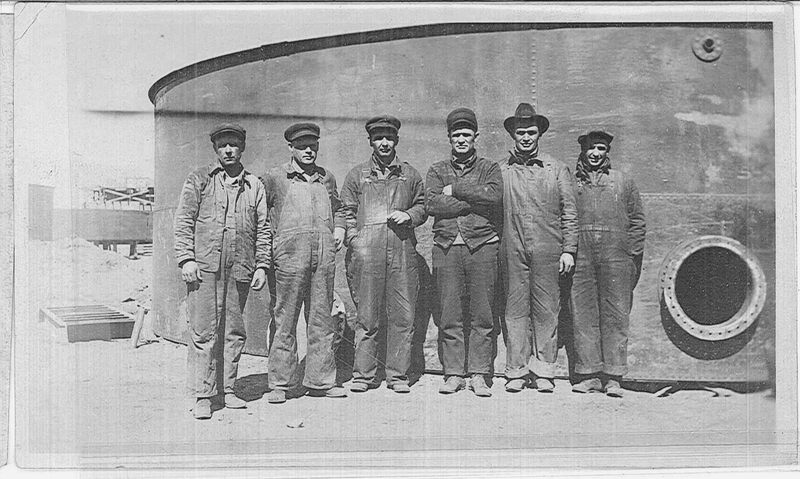 A group of men pose for a photograph in front of one of the storage tanks. 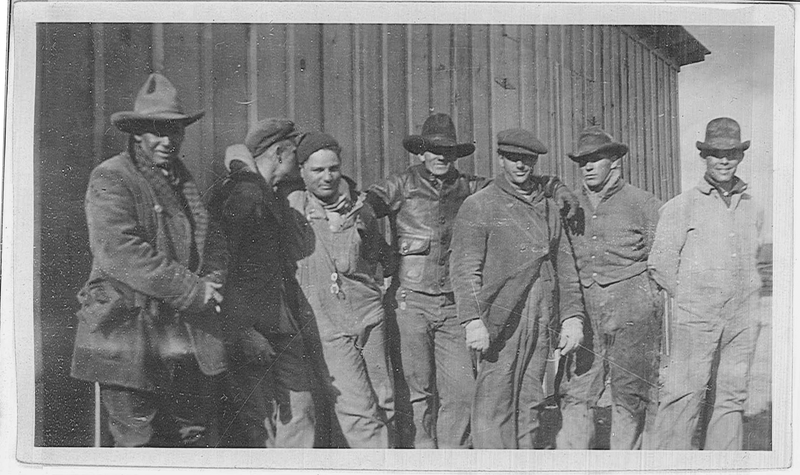 Unidentified workers taking a moment to pose for the camera. 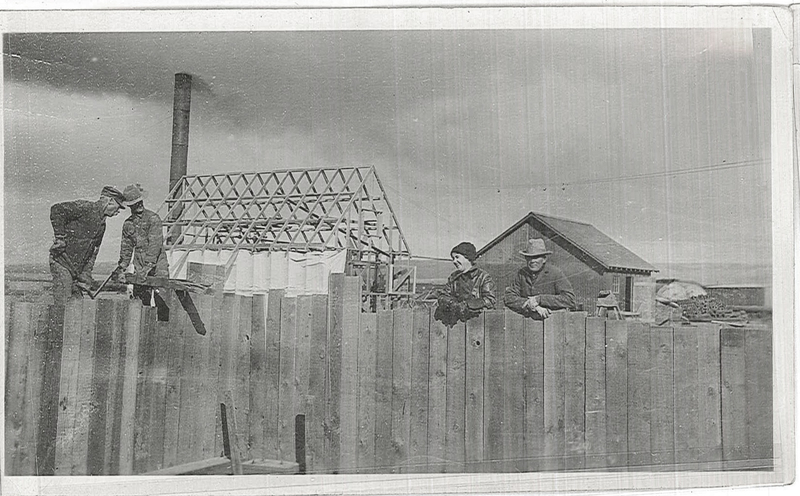 A group of men pose for the camera near one of the temporary buildings. 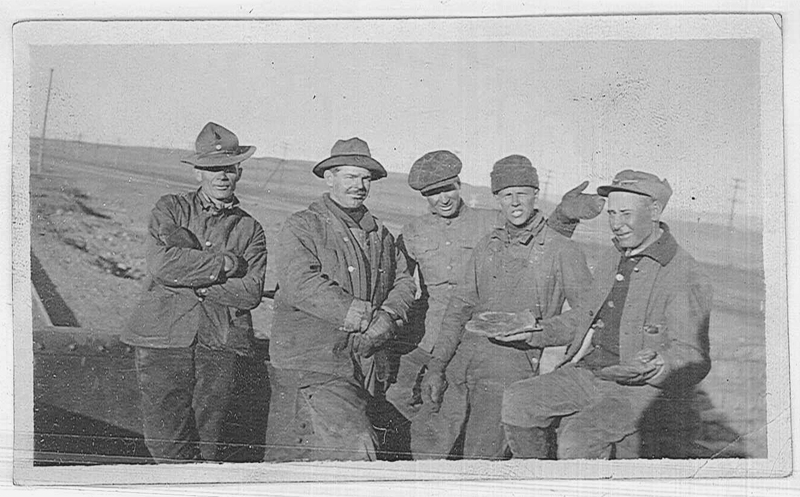 A group of unidentified workmen. The water table was found to be at five feet below the surface. This may have been an image used to provide evidence of this. Cement is prepared in a portable mixer. A concrete form is seen in the foreground. 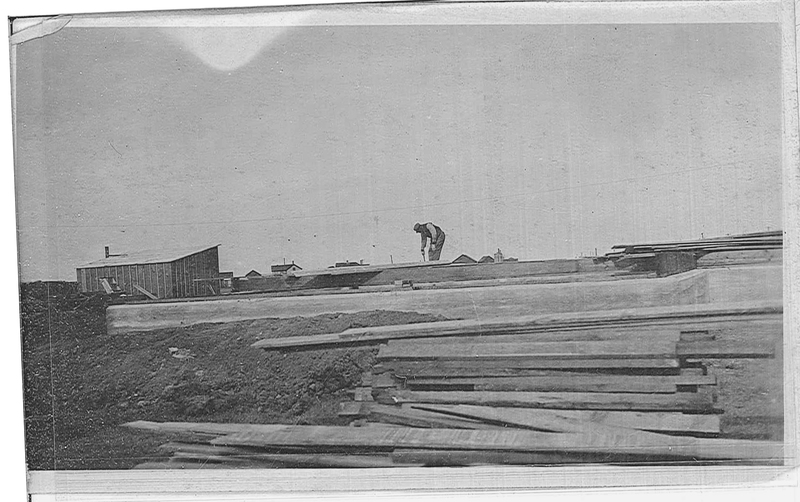 This foundation may be from the refinery office or laboratory. 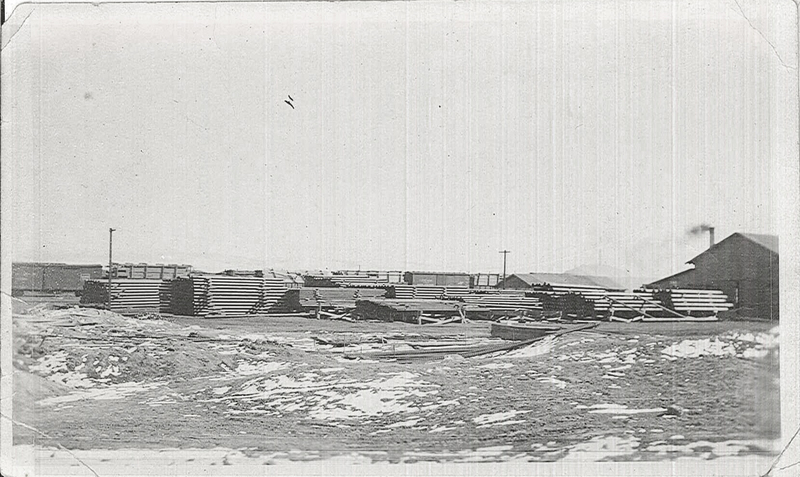 The buildings in the background were temporary construction buildings, similar to modern-day construction trailers. Note the wooden forms that are to the right side of the image. This series of “walls” are presumably buried under the still foundations. The forms for the stills are in the background. The forms that make up the still foundations are seen here in various stages of completion. The steel bars are made of twisted steel to provide additional support for the concrete. 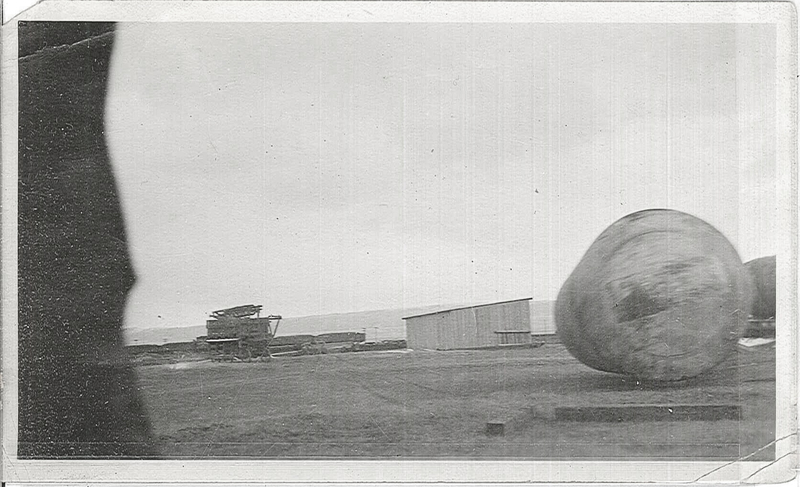 A view of a still tank. 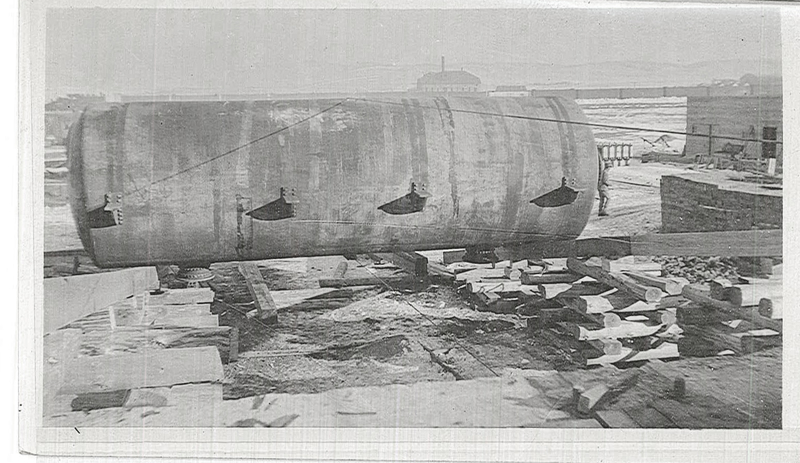 One of the still tanks appears to be readied for installation. 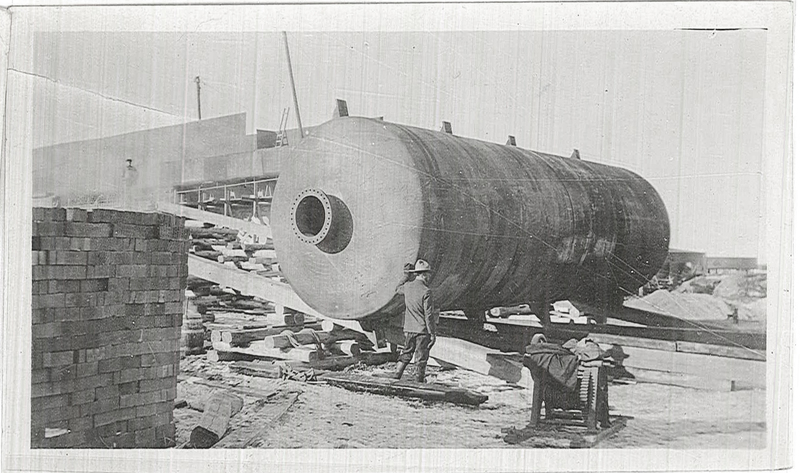 An unidentified workman stands next to a still tank. 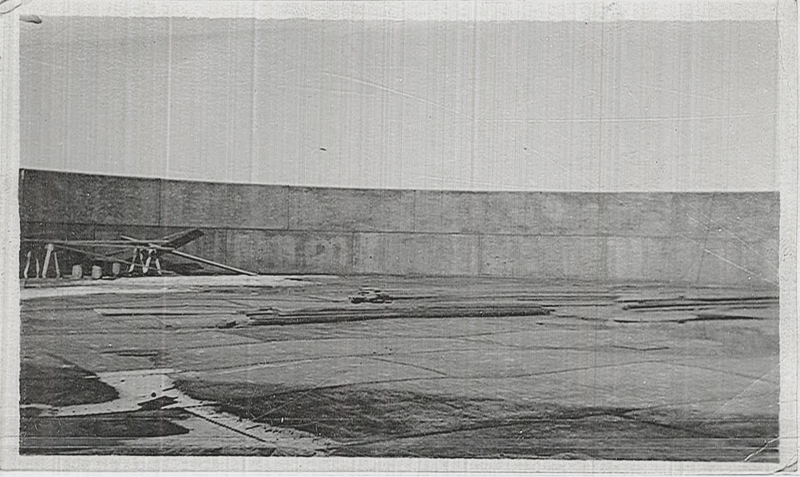 The tanks were rolled up and on top of the still foundations. The foundations here are from the north still bank. 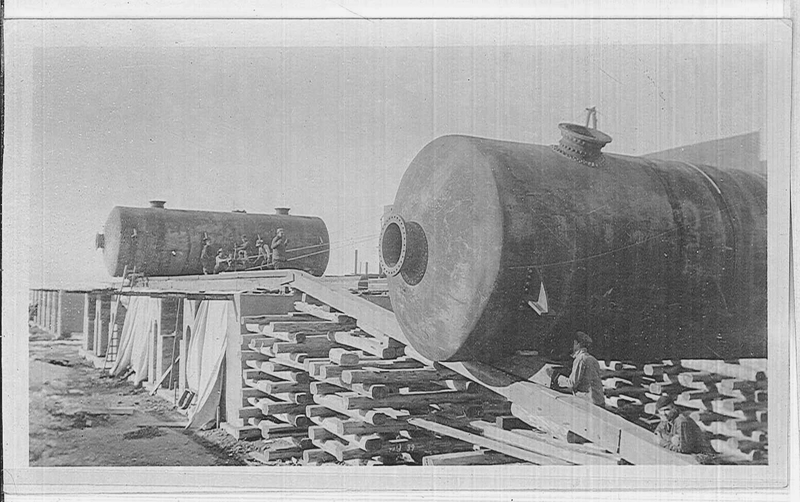 These tanks were 10′ in diameter, 30′ in length. 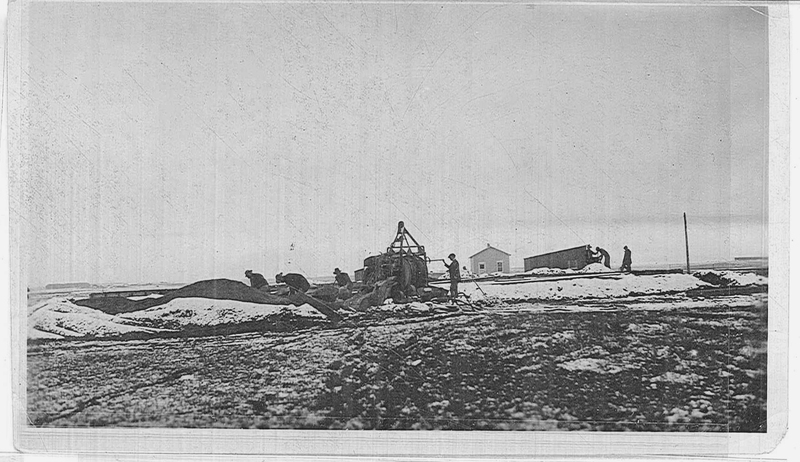 One of the still tanks is being rolled up the top of the foundations. 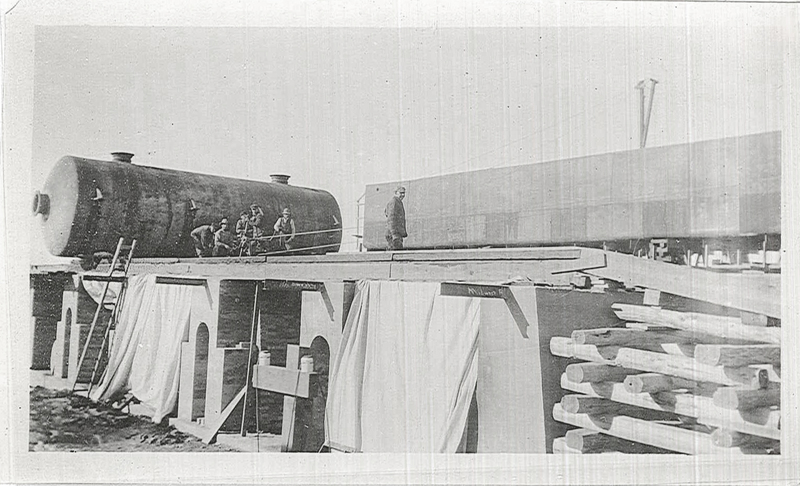 A still tank rests on temporary rails atop the foundations. 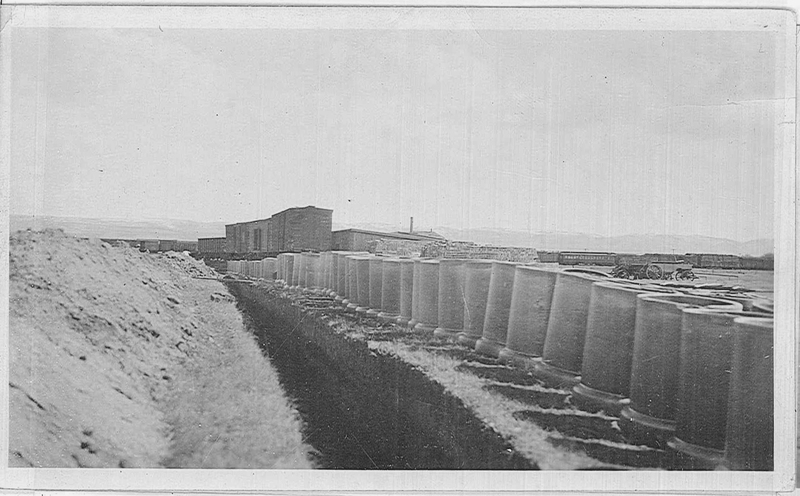 Standard Oil Refinery, Laramie, Wyoming, 1919, 1921, University of Wyoming, American Heritage Center, Wyoming-Laramie-Standard Oil Refinery photograph file.